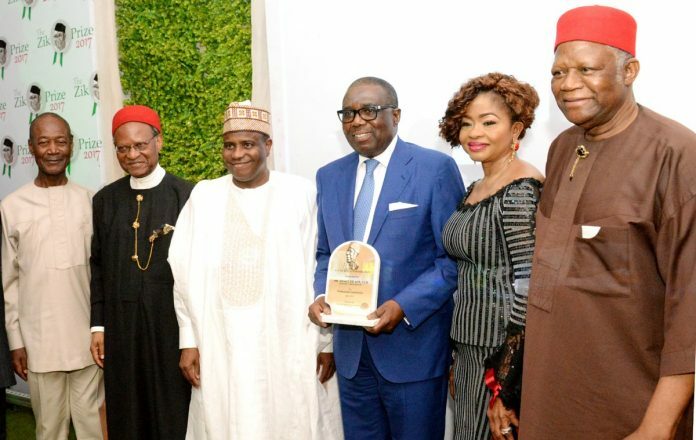 President of Dangote Group, Aliko Dangote, has vowed to prioritise Universal Healthcare Coverage (UHC) in the country just as he was conferred with the prestigious Ahmadu Bello University’s top Corporate Award over the weekend in Abuja. The 2018 Corporate Award was presented to the top industrialist in view of the numerous contributions of his conglomerate to the development of the educational sector in Nigeria, the University’s Alumni Association’s National President Professor Ahmed Tijani Mora said. Professor Mora said the interventions of the Aliko Dangote Foundation in the educational sector over the years have been unprecedented through, especially, the sponsorship of various scholarship programmes. Dangote, who was represented by the company’s Executive Director Stakeholders Management and Corporate Communication Engr. Ahmed Mansur, at the award presentation ceremony, said the award will spur the conglomerate to scale up its intervention programmes in all sectors. He said Dangote Group will not rest on its oars in ensuring that the educational sector achieved its rightful place in Nigeria. On the Universal Healthcare Coverage (UHC), Dangote, through his foundation’s Chief Executive, Ms Zouera Youssoufou, said the Foundation will continue to work with governments and civil society organizations for the development of impactful health sector programmes in Nigeria and Africa as a whole. Ms Youssoufou said the Foundation over the years have expended billions of naira in supporting the causes of health through its strides to eradicate Wild Polio Virus in Nigeria. She said the Foundation has made significant social investments in health, education, economic empowerment and disaster relief. Recently the Foundation made a pledge to commit $100million to fight malnutrition in some parts of the country, she said. “Dangote Foundation in partnership with Bill and Milenda Gates Foundation have been supporting the government in the eradication of polio,” she added. Speaking at the 2nd ThisDay Dialogue, with the theme: ‘The Journey to Universal Health Coverage in Nigeria’, she said Dangote Foundation will do all within its reach to ensure that an average Nigerian have access to good healthcare in the country. Also speaking at the event, Minister of Health, Prof Isaac Folorunso Adewole, who commended Dangote Foundation and other stakeholders, said the Muhammadu Buhari administration is not resting on its oars in trying to achieve a Universal Health Coverage (UHC). “Healthcare is a key driver of our socio-economic development and that is why our future success depends on our investment in the health sector,” he said. The Minister also launched the implementation of the Basic Healthcare Provision Fund(BHCPF) tagged HUWE, saying it is aimed at reaching eight million Nigerians in its start-up phase.